Dyson made its name by eliminating big frustrations people encounter when trying to accomplish one of the most basic household tasks: vacuuming. So what do you do when the big frustrations are gone? You tackle the little ones. Company founder James Dyson created the first vacuum cleaner without a bag, and he also created the ball-based design that made it easier to negotiate complicated room layouts. A couple of years ago, Dyson also eliminated the need for a filter with its Cinetic range. Along they way the company has also been working on improving battery life, power and ergonomics, and other pieces of the vacuuming puzzle, and the new Cinetic Big Ball Animal continues that work. The new Cinetic Big Ball canister vacuum also seeks to continue refining the model, getting rid of two remaining annoyances that can still making cleaning up a pain. The first is navigation; canister designs tend to get twisted and potentially flip while in use, and the Cinetic Big Ball gets around that with a canister designed around a ball-shaped main body, which will indeed resist attempts to knock it over, as you can see in the short GIF below. The ball body is clever and works, but for smaller spaces or ones where there are fewer obstructions, the more important design features are a long, flexible cord and the vacuum wand portion, which is long and light. Using the canister blends the power of a corded vacuum with much of the convenience of a portable, and Dyson has done particularly well at making sure both benefits translate without incurring many of the compromises of either design type. Dyson has also refined some of the more basic elements of canister vacuum design, including a new quick release attachment coupling system that’s easier than what the company has offered in previous generations, and which also includes an adapter bracket so you can still use existing attachments you have from previous machines or accessory purchases. And there’s an articulating handle for the wants that can rotate in three separate directions to make it easier to clean hard-to-reach places even when the canister’s firmly grounded. Dyson’s newest canister has a number of functional advantages over previous machines and competitors, but the main one in terms of convenience over time might be that it lacks any kind of general maintenance – including filter cleaning. The Cinetic line from Dyson all offer this more recent trick: even the low-maintenance, wash-once-a-month removable filter is gone, thanks to a built-in filtration system that weeds out microscopic dust particles before they ever hit the permanently installed filter. It can really seem like indulging in extreme laziness to complain about having to rinse something under a tap for a few minutes every month and then just letting it dry, but taking that single, minor pain point away actually makes a huge difference, because it’s one less thing you have to worry about. 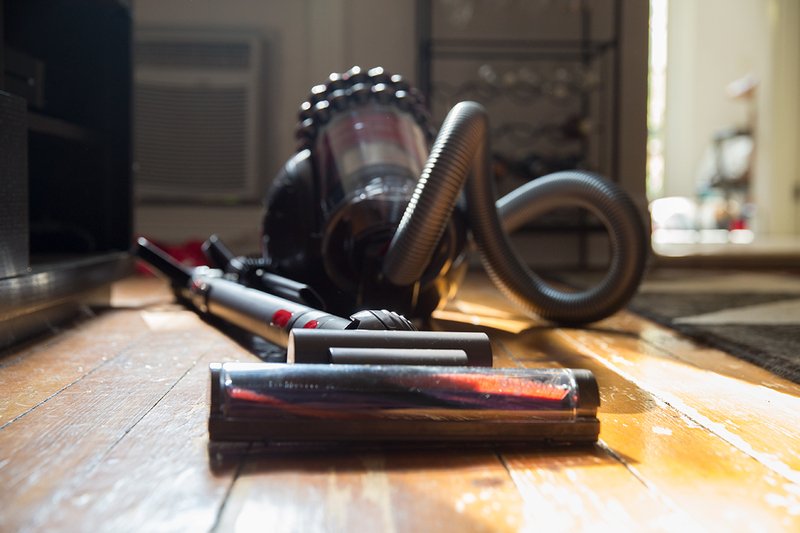 Another thing you no longer have to worry about is the dust cloud that typically results from emptying a vacuum bin. New to the Big Ball specifically is a bin emptying mechanism design that includes a silicone wiper part, which sweeps down the sides of the canister interior to push out the dust in a downward motion that does help a lot with making sure the finest dirt from your vacuuming session also makes its way to the garbage can, rather than either remaining inside as a fine layer, or blowing about in your interior air. Maybe the best thing that the Dyson Big Ball does, aside from its consistent, strong suction, is increase the canister size by a full third over previous generations. The extra space is appreciated, especially in an Animal model for pet owners who have pets with a tendency to lose their fur all over the place. My own dog coats the carpets and floors with golden hair – you can spot them in the vacuum photos pretty easily. But the Cinetic’s expansive repository handled a full living room carpet’s worth of dog hair without issue. 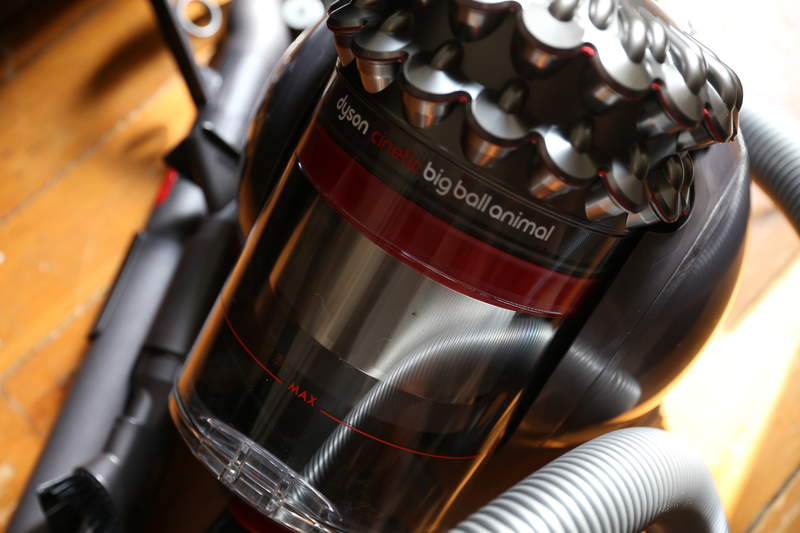 Dyson’s Cinetic Big Ball Animal features a number of attachments in the bag, including a carbon fibre turbine head; a hard floor tool that can pivot for getting under tables and chairs more easily; a tangle-free turbine tool for ridding furniture of pet hair; a stiff bristle brush for scraping dried dirt; a combination tool for corners and other small spots; a stair tool; and, key for an Animal model, a Dyson groom tool that lets you vacuum your pet directly to remove excess shedded coat. The lineup of accessory heads is fairly comprehensive, which is good because once you’ve purchased the Cinetic you likely won’t want to be spending too much more on accessory packs. The primary carbon fibre turbine head is also designed to capture fine dust, and also features strong nylon bristles to work out dried dirt, meaning it rarely comes off the vacuum in my experience. Still, all the other add-ons mean you have the option to get a tool better suited to the job at hand when you need it – and my dog loves the grooming tool, too. 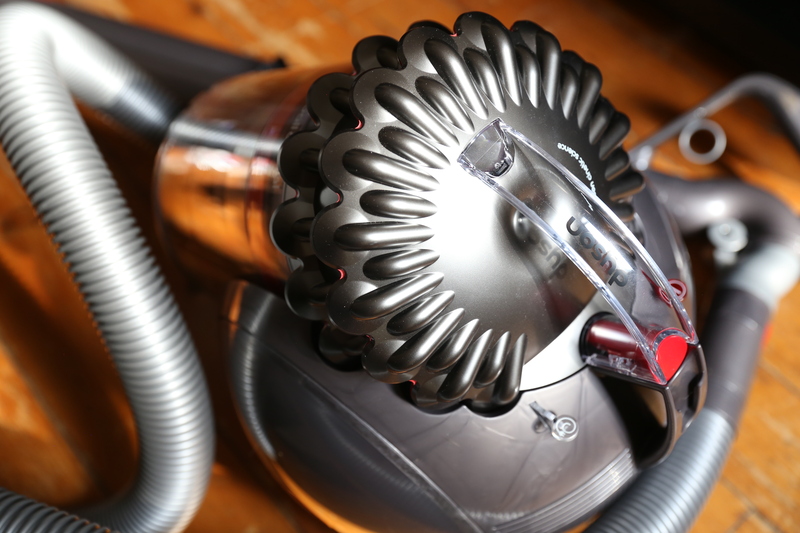 This latest vacuum from Dyson may not feature revolutionary new tech, but it does benefit from years of innovation from the vacuum-maker, with a bagless design and a built-in filter that requires no cleaning or placement. And it offers refinements that really do improve the overall experience of vacuuming, including the self-righting body design and the improved bin-emptying mechanism. As with Dyson’s other offerings, all of its features and functionality come at a premium – $699.99 ($799.99 in Canada) – but with its accessory kit, lack of consumables like bags and filters and Dyson’s reputation there’s a lot of value built into that price tag as well.